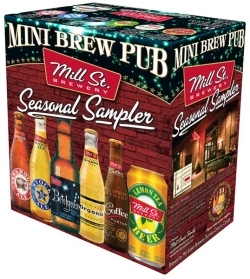 TORONTO, ON – Mill Street Brewery has released a new edition in their Mini Brew Pub series of sampler six packs for Winter 2010. This edition includes bottles of Tankhouse Ale, Stock Ale, Organic Lager, Coffee Porter and Betelgeuse Belgian-Style Tripel, as well as a 473 ml can of Lemon Tea Ale. The pack is available now at LCBO outlets throughout Ontario for $12.95. Also out now is the 2010 vintage of Mill Street Barley Wine. Packaged in a unique 500 ml ceramic bottle, it is available at the LCBO for $11.95.